In a fellowships interview, I was once asked to describe a time I failed. It was a standard question, and I launched into my usual response: "Well, I had to go through three training cycles before I was finally able to run a marathon..."
My interviewer cut me off. He didn't want to hear about a failure that became a success. He wanted to know a time I really failed, totally blew it, and that was it. Just failure. Caught off-guard, I had to fumble for a response. 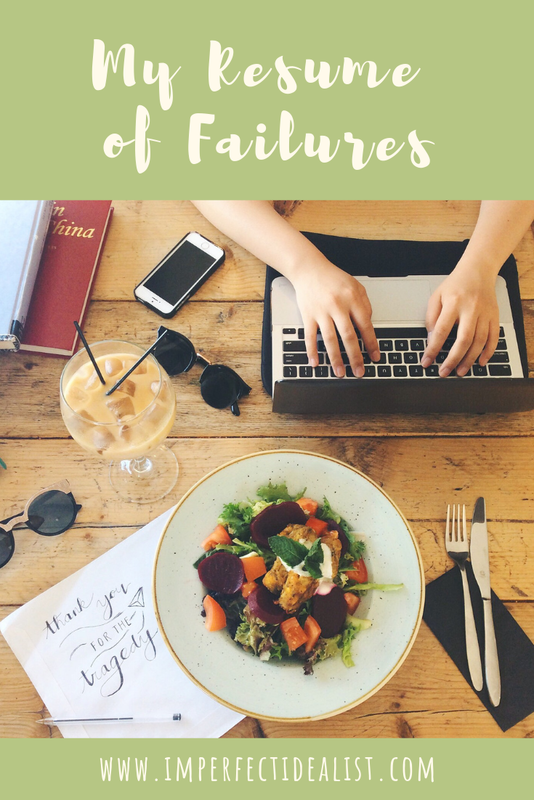 Like many people, I'm not attuned to disclosing my "pure failures," especially in a professional setting. We're taught to emphasize our achievements, skills, and strengths. Even when we're asked for the less-savory parts of our character ("What is your greatest weakness? "), we're told to filter out the unappealing weaknesses ("I have a hot temper" or "I'm lazy") and opt instead for a weakness that could also be seen as a strength ("I'm sometimes too detail-oriented that it slows me down"). 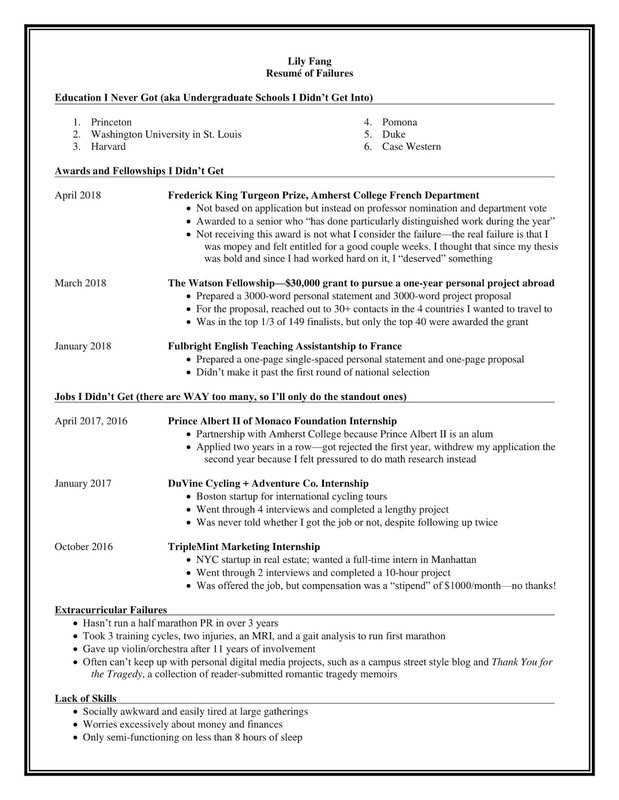 So, the first time I stumbled upon a resumé/CV of failures, I knew I wanted to make my own. Our tendency to selectively share success is equally prominent in social media, what many people like to call their "highlight reel." I think it's important to be reminded that our lives are far from our curated Instagram feeds, joyous Facebook photos with friends, and celebratory announcements on LinkedIn. Behind every success and happy moment, there's a story of struggle. The concept of the resumé of failures is attributed to Melanie Stefan at the University of Edinburgh. It was popularized by Johannes Haushofer from Princeton University, when his CV of failures when viral. I'm not a professor (perhaps something my parents would consider a failure haha), so I've decided to vary my resumé a little, adding a section for extracurriculars and lack of skills. Hopefully it'll give you a good laugh and make you reflect on your own experiences. If you want to make your own failure resumé, you can download mine from Google Docs and use it as a template (just click "File" in the top left, then "Download as" a Word document). If you want to see my "success"/real resumé, you can add me on LinkedIn.